The green mountains of Chiang Mai will be your new happy place. Fiercely devoted to tradition and tranquility, Chiang Mai is a world apart. Here, Buddhist monks welcome curious visitors into their sanctuaries for meditation, and thousands of floating red lanterns fill the sky during Loi Krathong festivities. Drawing on the local experience of our Chiang Mai travel agency team, Backyard Travel’s tailored Chiang Mai tours will guide you to the peaceful beauty of city temples, the effusive clamor of fragrant night markets, and the misty splendor of mountain roads. Backyard’s local knowledge means you get more freedom to do what you want, because our insider tips make travel in Chiang Mai affordable, easy, and authentic. Browse our itineraries and see what you can do on your Chiang Mai journey. What our Clients say about our Chiang Mai and Thailand tours? 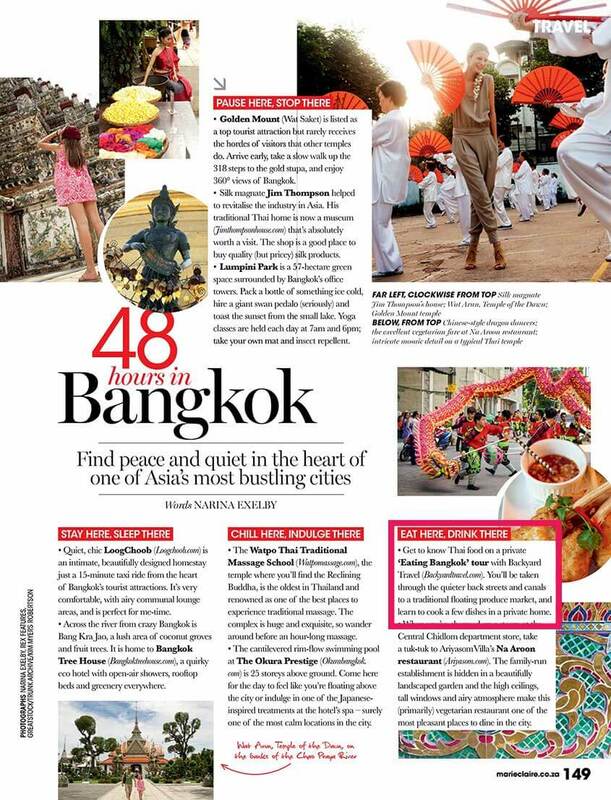 Mar ’15 “A popular destination for foreign visitors: we explored Bangkok for a few days with Backyard Travel to get a feel for what some are calling Asia’s “City of Angels”..
Want to Learn more about Chiang Mai? Because Backyard is a locally staffed Chiang Mai travel agency, you get the insider’s perspective on the city. On a tailored Chiang Mai vacation you’ll not only see the city’s sights, but learn about Chiang Mai’s distinctive history and culture from the welcoming, laid-back locals that set this place apart. Rivaling Bangkok in sophistication and urbanity, Chiang Mai’s creative, enthusiastic residents have a far more laid-back and gracious demeanor. “Bend with the wind” is the life philosophy. The dry months between November and March have the most pleasant weather. The rest of the year can be hot and rainy, but there’s still plenty to do, perhaps even better with fewer tourists around. From elephant rides and river boat cruises in the surrounding hills to stylish coffee shops, rowdy bars, and topnotch restaurants, Chiang Mai has attractions to keep you entertained and up late. Culture structures life in Chiang Mai. Visit during Songkran (Thai New Year) and get soaked in the water festival. Or come for the autumn Loi Krathong festival for revelry, religious pomp, and breathtaking customs. Most inhabitants of Chiang Mai speak Kham Muang, also known as Lanna or Northern Thai. Standard Thai is also the norm, and English is widely spoken as the city is a hub of tourists and expats. Chiang Mai settled in the 13th century as the capital of the Lanna Kingdom. Today Lanna influence can still be seen in the city’s language, food, and architecture. Don’t miss Wat Chiang Man, the oldest temple in the city. Your dream trip should be worry-free and rewarding. That’s what Backyard’s local Thailand team are committed to. Intimate insider knowledge helps us design your tailormade Chiang Mai holiday so you can chill out and enjoy.